Like each year, the Eurocat in Carnac – France, is one of the most important sport catamaran events in France. With more than 150 boats registered, the four days of regattas and long distance race “Voiles et Voiliers” organized by the Carnac’s Yacht Club were a success. The long distance race took place on Saturday May the 3rd. For the Flying Phantom and the Phantom Sailing Team, with Gurvan Bontemps and Benjamin Amiot, it was a unique opportunity to confront a fleet of 169 boats against some of the top French and European sailors around the Island of Houat. The briefing was performed at 9:00 am by the organization, who gave special instructions for the long distance event that followed the historical Eurocat course around the Island of Houat. Weather forecast announced an eastbound wind speed of 5 to 15 knots with a partly cloudy sky. At 12:05 pm the competitors lined up on the starting line in front of the Carnac’s Yacht Club and started the race at the send off of the race committee. The first leg was upwind of the offset mark. When most of the fleet took to the left of the route, along Carnac’s beach, Gurvan and Benjamin keep to the right and reached the top mark at the same time as Iker Martinez and Fernandino Van West who were sailing on a F18. After the top mark, the leg was downwind to a show buoy anchored off the yacht club access. Iker and Fernandino hoisted their spinnaker whilst Gurvan and Benjamin began to fly on the Flying Phantom, thus taking the lead of the race. This was the only moment during the whole race where the Flying Phantom was in contact with the fleet. Once the show mark was rounded, the Flying Phantom started to fly at a speed of around 25kts for a long reaching leg along the Quiberon’s peninsula and took a tremendous lead over the fleet. In front of the south Quiberon mark, the wind dropped and the Flying Phantom moved to a skimming mode to reach the Bonen Bras gate at the north tip of the Island. The island was to be kept on starboard. As the wind was coming from the east the Flying Phantom went along the south side of the island in close hauled. The first tack occurred at the south west tip for another leg in close hauled up to the east side, where the Flying Phantom came back to reaching and flew gently following the beautiful Treac’h ar Goured long beach. The wind dropped down from 10 kts to 5 kts while sailing through Quiberon’s North gate, the last stretch was consequently slower but nevertheless Gurvan and Benjamin flyed across the line completing a time of 2 hours 5 minutes and 20 seconds. 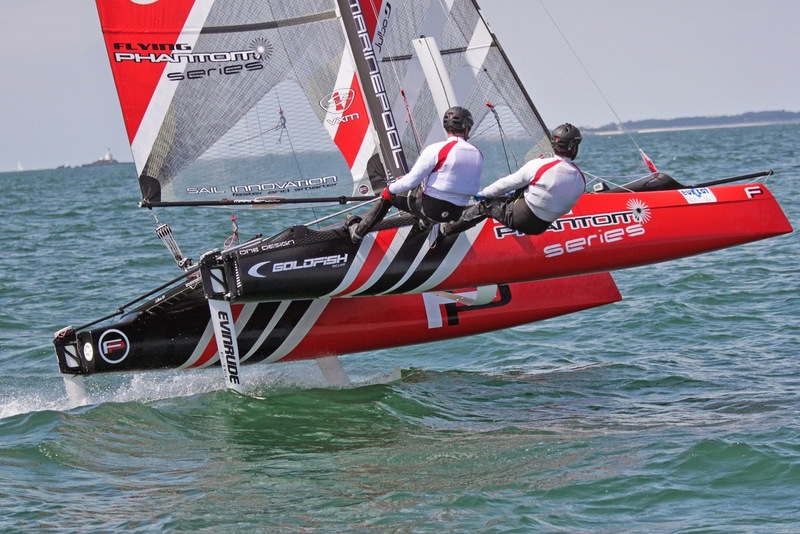 The Phantom Sailing Team exploded the last Eurocat’s long distance race record by 24 minutes and 54 seconds, which was formally held by a Nacra F20 in 2010 crewed by Peter Vink & Sven de Laaf. The second boat, an F18 helmed by Morgan Lagravière and crewed by Arnaud Jarlegan, arrived 20 minutes after the Flying Phantom, finishing the race with a time of 2 hours 26 minutes and 7 seconds, 49 seconds, ahead of Iker Martinez and Fernandino Van West. “The project was launched three years ago, but we started sailing sessions 2 years ago. Unfortunately most of the time the sessions are performed with only the Flying Phantom itself, so it is difficult to compare performances. Le raid du Goelo, 2 months ago, was the first race in which we participated and the first time we aligned the Flying Phantom with other boats. This is why the Eurocat long distance race is for us a unique opportunity to benchmark in front of F18 boats driven by the best sports catamaran sailors in France and Europe. The race was a little bit stressful as it was long, wind conditions were very variable and in order to win we had to finish without breaking anything. I am very happy by the result: beating the record by 25 minutes is a true demonstration of the Flying Phantom performances and its ability to race and perform efficiently in such events. The Eurocat is one of the biggest events in Europe and was a key milestone in our agenda. I am really looking forwards to the next races in Switzerland, with the Genève-Rolle-Genève, and in the Netherlands, with the round the Texel. 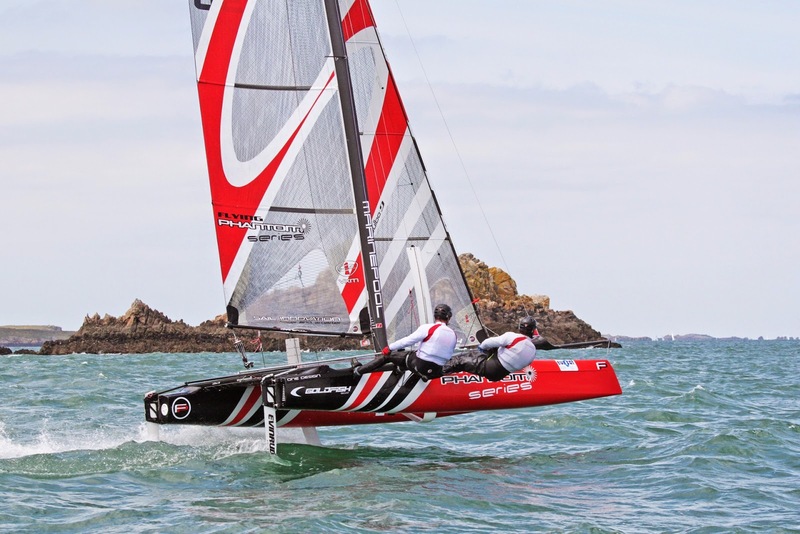 Two times Olympic Gold Medalists and members of the Red Bull Sailing Team (Extreme 40) , Roman Hagara and Hans Peter Steinacher came to Brittany, St Lunaire, birthplace of Phantom International, for two days of epic sailing. The 2 world-renowned sailors and Red Bull Youth America’s Cup Sport Directors enjoyed both sportive conditions with a strong off shore breeze and gusts of up to 25 knots on the first day followed by calmer weather with moderate sea on the second day, which still gave them the chance of experiencing high speed foiling.